Forest area in Slovakia has deen expanding throughout the years. Today, according to the National forest inventory data (2005-2006), the forest area accounts for 44,3% of the country’s territory. Forests, according to their function are classified as commercial (2/3), protective(1/6) and forests of special purposes (1/6). Protective forests include stands that have mainly protective functions, such as soil protection and others. They are located on extremely unfavorable sites such as high mountainous areas in the zone of dwarf pine. 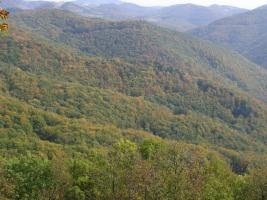 In general, Slovak forests have a great diversity and a relatively even tree species composition. Beech covers the largest forest area (1/3) and other species follow such as spruce (1/4), oaks (1/10), fir, larch, hornbeam, maple, ash, and other broadleaved trees. Forest composition and species diversity is an indicator of forest stability and health. Furthermore, mixed coniferous and deciduous forests provide an overview of species diversity. In Slovakia, deciduous forests dominate (they cover approximately 50%), while pure coniferous stands cover only 20%. The proportion of coniferous and deciduous species in a region corresponds with the proportion of coniferous and deciduous in the whole country.